Have you ever had a brown backside after a ride? Have you tried fenders/mudguards? Every time I ride a bike without mudguards I remember exactly why I love them. Fenders/mudguards keep me and my bike both cleaner and dryer than without. I am here to tell you that good quality guards will NOT rattle, they will NOT rub, they will NOT be fragile and they will NOT bend. You will have to invest some time customising them to your bike properly (this is a great job to palm off to a pro mechanic) but the rewards will be plentiful, I promise. And just to clear up the terminology: fenders, mudguards and guards refer to the same thing. Most people from the North American continent tend to use ‘fender’ while the rest of the world seem to have settled on ‘mudguard’. Why Use Mudguards And Fenders? Fenders stop water, grime and mud spraying into your face and all over your clothes. Even if you never plan to ride in the rain, a fenders job will continue long after the clouds leave as water loves to sit on the road. On bike trips, fenders make walking into shops, pubs and hotels a much more pleasurable experience for everyone involved. Oh, and if you wear glasses, you can expect far less scratches on your lenses. Fenders reduce the amount of grit that sprays onto your chains, cogs, bearings, rims, pads, brake calipers and cables – prematurely wearing them out. By keeping your components cleaner, they will simply last longer. Another bonus; you can now clean your bike less frequently! If you’re riding in a group, fenders will put the water back on the ground rather than all over your friends. What To Look Out For In A Good Fender Set? Coverage – The longer the fender, the more effective it is at keeping water and grit off you and your bike. Rigid – Rigid fenders are quiet and will not rub on your tyres. Metal fenders are often stiffer and more rigid than their plastic friends, but some plastic fenders use a metal core, double-struts and good-quality mounting hardware to keep them in place. Deep – A fender with a deeper profile will direct water flow out the bottom rather than the sides. Adjustable – To get the most out of your fenders, you need them as close to your wheel as possible. Adjustable length struts and fittings are essential. Stainless steel hard wear – You don’t want rusty struts and bolts. Make sure the mounting kit is 100% stainless. Double struts on plastic guards – More struts equals less movement with plastic fenders. Nothing sharp – Good quality fenders will have covers for any exposed sharp surfaces which will stop you scratching your skin and tearing your clothes. Quick release clips – ‘Securi-clips’ are a good idea for a touring bicycle as they allow the mudguard to open up if debris gets caught in them. Fenders don’t always come with mudflaps, but they’re easy to fit. These flexible flaps at the end of your fenders will give you and your bike extra protection from water and grime; they shoot the water back down to the ground where it belongs. Will Full Length Fenders Fit Your Bike? Seatstay bridge – Is there a small tube attaching your two seatstays? Drilled fork crown – Can you run a bolt through your fork crown? Touring bikes and many cyclocross bikes will have all of these things, and will fit full-length fenders rather easily. Road bikes very rarely have eyelets, but the biggest issue they face is too little clearance, making ‘clip-on’ guards almost always required. There’s one exception though: the excellent SKS Raceblade Longs. Again, modern mountain bikes won’t have any provision for guards, so clip-on guards (seatpost and fork crown) are a popular option. How do you fit mudguards and fenders to your bike? Fender setup is absolutely paramount for both the effectiveness and durability of your guards. The longer they are, and closer they are fitted, the better they will perform. Try and get an even space between the tyre and fender (fender line). Some riders have their fenders break after 1000km, and others have the same fender last 100,000km. Fenders must be fitted with minimal stresses to their structure. If you can, use spacers to make up gaps rather than bending them to fit. 26 and 650b wheels can often share the same fenders given their similar size. 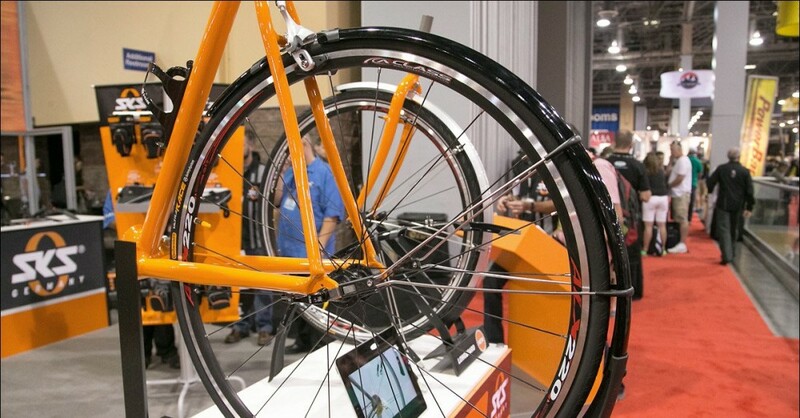 700c wheels are significantly larger in radius and will likely require their own size. This is especially important for metal fenders, plastic fenders tend to tolerate a bit more. You will need a 20mm gap between the top of your tyre and fender, and 5mm either side. Fenders are measured on the outside (not the inside), so subtract 10mm off the fender width to determine the maximum tyre clearance. Eg. A 45mm wide fender will fit a 35mm wide tyre. If you’re using road or v-brakes (rather than canti or disc), you’ll need to measure your brake clearance. Standard road calipers often clear 35mm wide fenders, long-reach calipers 45mm and XL-reach calipers 50mm wide fenders. V-brakes can have trouble with widths 50mm and up, that is one of the reasons why touring bikes still use cantilever brakes. Don’t have eyelets on your frame and fork? Have no fear, you have options to connect fender struts to your bike. Quick release axle runners by Axiom, Soma or Velo Orange are perhaps the most elegant option for creating eyelets. A more common option for those who have thru-axles or would prefer to use their frame as a support: universal p-clamps. Sometimes seatstay bridges can have vertical or horizontal mounting holes. To use a vertical hole you will need to drill your fender. You can adapt a vertical hole to horizontal using an ‘L’ bracket. Axiom fenders use a seatstay bridge mount which is designed to be zip-tied if you don’t have a bridge at all! You will likely need to space out the bolt on the chainstay bridge to get a good ‘fender line’. If you don’t have a chainstay bridge you can connect your fender to your seat tube. The best way is often to drill a hole in the fender and attach it to a ‘single shifter clamp’. You can also make a bracket that connects from the BB shell. Or an even simpler way again is with a presta valve adapter, some rubber and tape. You fork crown may not be deep enough under the headset, so that’s where Sheldon Fender Nuts, Peter White Bolts or Gilles Berthoud Brake Nuts can come in handy by spacing your fender mount back a few millimetres. Metal fenders will often be designed to use ‘fork crown eye bolts’ so that they can connect vertically underneath the crown. Problem Solvers Fender Flutes allow you to optimise your fender line if you need to, most commonly required on 29er adventure touring bikes. You can bend your struts around your brake caliper. The neatest way for single strut fenders is often under the caliper, and with double struts it’s out and around. Long bolts and spacers are available to clear brake calipers too. Another option is to mount directly to your front rack eyelets. 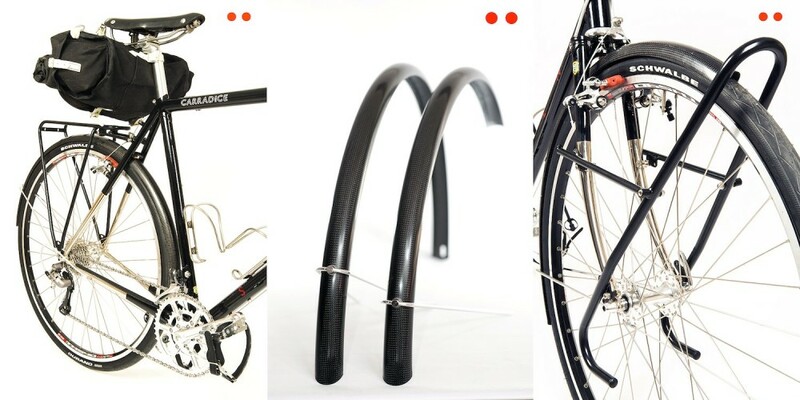 If you have a rear rack that will allow it, connect the fender directly to your rack to overcome this problem. Option B is would be to use Axiom Disc Runners (or long bolts and spacers) which space your struts out and around your caliper. You may need a Velo Orange Spring Thing to get your wheel in and out easily with your well-fitted fenders. You will likely require p-clamps at the fork legs (especially for thru axle forks) and zip ties at the crown if there is no bolt hole. Metal fenders look amazing and are often more effective than plastic options. Their effectiveness can be attributed to their longer and deeper design than most plastic options. If set up correctly, aluminium and stainless fenders should last a lifetime, but keep in mind that setting up a metal fender is not a simple task; it’s laborious and will almost always require lots of measuring and drilling. I’ve found that if you force metal fenders into place at setup, they will stress and eventually fail. Make sure you take your time, get the washers right and space them out nicely. In terms of weight, aluminium guards are often around 450g, while stainless steel is closer to 600g for a set. Plastic fenders are easy to fit (30mins max) and you won’t need much more than wire cutters, spanners and allen keys to complete the job. The most durable plastic fenders have a metal core which helps them maintain stiffness and durability. You can increase the effectiveness of plastic fenders by attaching long mud flaps. I’ve found that plastic fenders travel far better than any other option because they tolerate more flex; I simply undo the lower mounting bolts and leave the fenders attached to my bike when I fly. Plastic fenders often tip the scales at around 500g including hardware. My preferred manufacturer: SKS. Why? They travel extremely well. They’re durable, easy to fit and quiet. I have four sets: one of them has done over 40,000km of touring around the world including 10+ flights, lots of trains, buses and cars, and it’s still going strong. My other sets have been on other touring/city bikes for close to 10 years, without failure. Bontrager NCS – No cutting required which makes them the easiest to fit full-length guards. What Good and Bad Experiences Have You Had With Fenders?